By Stefan Hamelin, M.D., William T. O’Brien, Sr., D.O. Can you tell how this patient presented clinically? This axial T2 image demonstrates a large hypointense suprasellar mass which is eccentric to the right and encroaches on the cavernous segment of the right internal carotid artery. When presented with a suprasellar mass, determining whether or not there is cavernous sinus invasion is critical in terms of management. Cavernous sinus invasion is suspected when a mass encircles two-thirds or results in narrowing of the cavernous internal carotid artery. With cavernous sinus invasion, patients may present with cranial nerve palsies. From superior to inferior, cranial nerves III, IV, V1, and V2 travel along the lateral wall of the cavernous sinus. Cranial nerve VI is located medially within the cavernous sinus, making it more vulnerable in cases of cavernous sinus invasion. With CN VI (abducens) palsy, the lateral rectus muscle cannot rotate the globe laterally; thus, the affected globe is medially rotated. This is a unique case in which the lateral rectus palsy can be seen on imaging with the right globe medially deviated, resulting in a disconjugate gaze. 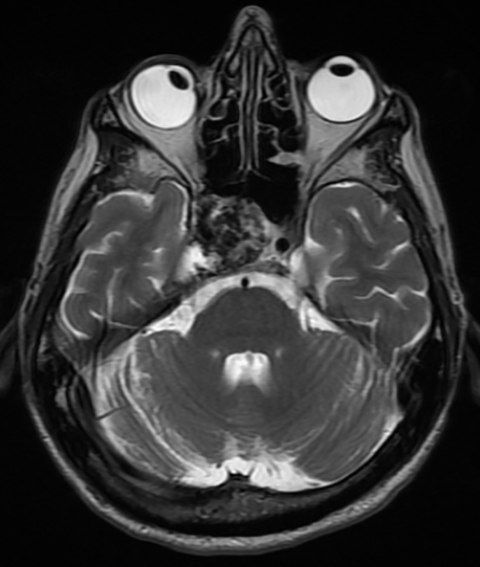 Hamelin S, O'Brien WT Sr. At the Viewbox: Cavernous sinus invasion with cranial nerve palsy. J Am Osteopath Coll Radiol. 2012;1(1):39.